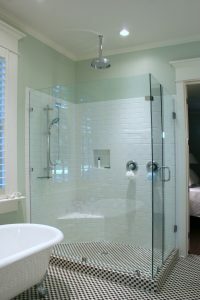 Why have glass shower doors and glass tub doors become a standard in home interior design? For a house to be truly luxurious, the interior must feature an open architecture, elegant touches and the highest quality materials. Glass enhances the look and feel of any bathroom and has become an integral part home architectural design. Available in an array of colors, thickness and designs, glass is able to fit in multiple sections and provide containment of heat and moisture present in a shower or bath tub. The shower is an integral part of any house which is why it must be designed with safety and beauty in mind. Glass shower doors range from 3/16 thick for framed applications to 3/8 inches in thick for frameless applications. For comparison, this thickness range is similar to glass entry doors. This ensures that they do not dent or get broken in case of impact on closing. It must be constructed using tempered glass to ensure that it remains in good condition despite coming into contact with hot and cold water. In case of accidental breakage this glass breaks into tiny, circular pieces that pose little to no danger. Some of the options available for door construction include standard clear, bronze glass, ultra-clear high definition glass, frosted, rain glass and gray glass. Installation of glass is a delicate job that requires seasoned hands and expertise. Any error with regards to measurements or correct use of tools can end up costing you entire glass panels and time. In case of damage to glass shower door, a glazier can be called in to assess the situation and recommend the best way to install a replacement. When a glass shower door is broken it is usually necessary to complete a glass shower door replacement. However, framed structures may only require replacement to be done an individual glass panel or other features with broken glass.